1. 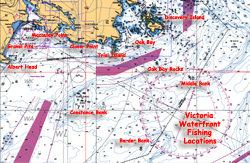 Albert Head - Great spots to anchor for halibut, troll 100-200 feet for winter springs Nov-May and shallower for summer salmon May-Sept. Can be drifted for halibut and rockfish as well. 2. Gravel Pits - Great crabbing 30-200 feet, can be trolled for winter springs Nov-May. 3. Macaulay Point - Summer spring salmon May-Sept 30-60 feet, winter springs 100-200 feet. Some crabs, sometimes good for drift-fishing halibut. 4. Clover Point/Flag Pole - Winter Springs Nov-March 100-200 feet, halibut 100-300 feet when tides slow. 5. Trial Island - Summer springs May-Sept, halibut when tides slower by anchor 100-200 feet. 6. Oak Bay Rocks - halibut by anchor slow tides only. Shipping lane, be careful. 7. 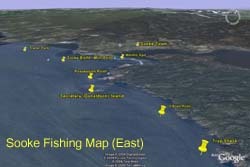 Constance Bank - awesome winter fishing 80-200 feet Nov-May, halibut 60-300 feet. Can be drift-fished, but anchoring preferred, slow tides only. 8. Border Bank - Winter springs Nov-May, halibut 90-300 feet. For safety, keep away from the Can-USA border at least 0.25 mile. Anchor is best, but can be drift-fished. 9. Oak Bay - Can be trolled for winter springs Nov-May on the bottom, 60-200 feet. 10. 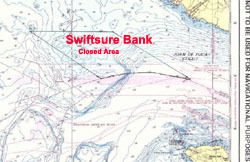 Middle Bank - Halibut and rockfish. 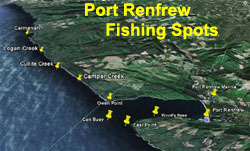 Several areas here closed for fishing in Rockfish Conservation Area (RCA), refer to GPS. Can be fished for winter springs Nov-May. 11. Discovery Island - Good rock fishing, winter springs and halibut on just about every pinnacle. Winter Springs are Nov-May. Very strong currents, anchor with caution, watch for shipping traffic. 1. 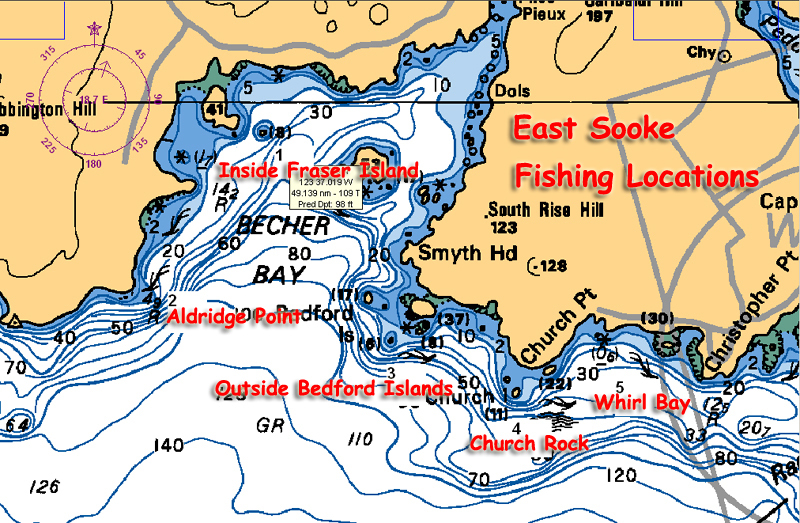 Outer West Race Rocks - Good for halibut when anchored, CHECK CURRENT TABLES, no current faster then 1.5 knots or you won't get your gear down. Some rockfish. 2. 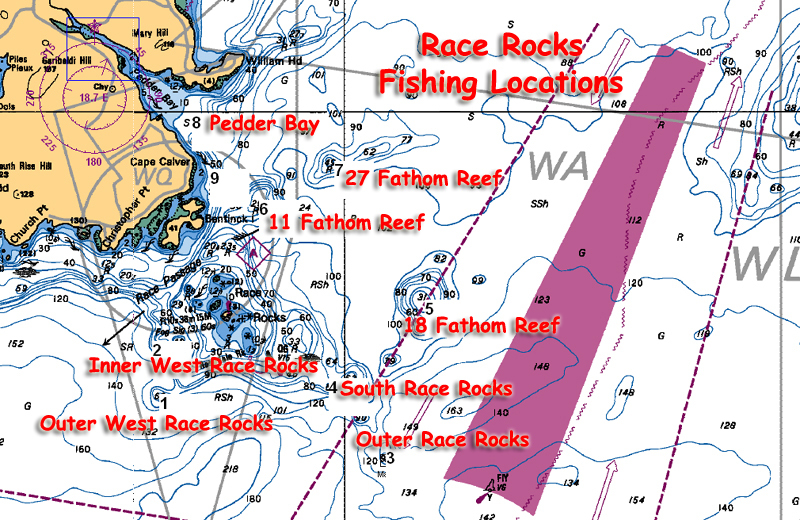 Inner West Race Rocks - Stay deeper then 120 feet as there is a closure along the 20 fathom line around the rocks. Fish here on any slack or ebb tide, the rocks protect you from pretty much the hardest ebb currents. 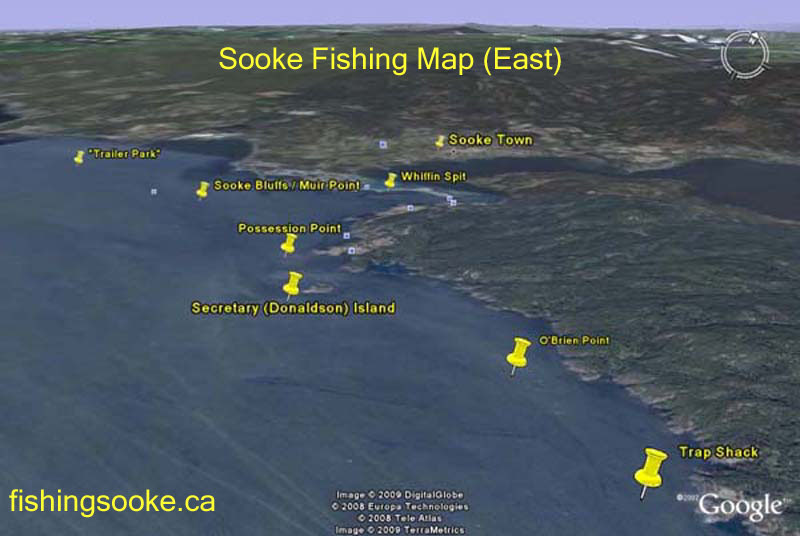 Can be drift-fished, gravel bottom, lots of halibut, sometimes winter springs Nov-Feb, lots of rockfish. 3. 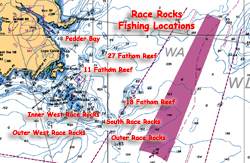 Outer Race Rocks - Sometimes halibut/ling, but in the middle of a shipping lane so watch out for traffic. BE CAREFUL OF TIDES, DANGEROUS ON FAST TIDES. 4. South Race Rocks - Halibut on slow tides, slack tide best. 5. 18 Fathom Reef - Halibut on slow/slack tides. Anchor with bait. 6. 11 Fathom Reef - Halibut/rockfish on slow/slack tides. Anchor with bait. 7. 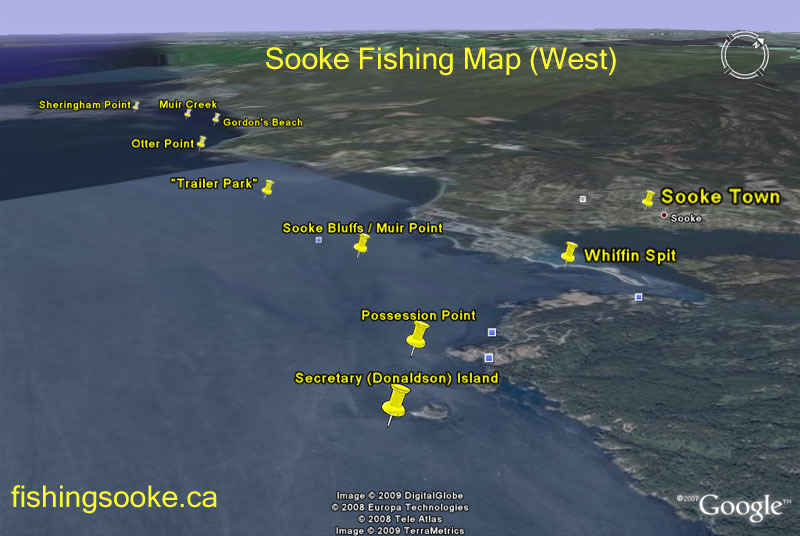 27 Fathom Reef - Halibut Hotspot, can be fished up to 2knt tides, anchor with bait. 8. 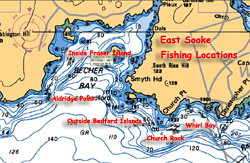 Pedder Bay - Can drift-fish for halibut deeper then 100 feet, good crabbing shallower then 60 ft, some rockfish opportunities along William Head side. 1. Inside Fraser Island - Great fishing for Winter Springs on the bottom Nov-Dec, can be fished until April. Can be fished any tide, and just about any weather. Great crabbing inside Fraser Island. 2. 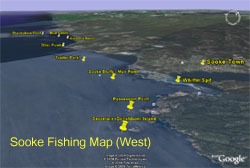 Aldridge Point - Summer Chinook 30-80 Feet, Winter Springs on the bottom Nov-Feb, some rockfish. 3. Outside Bedford Islands - Winter chinook between here and Church Island all along the bottom Nov-April. Very rocky, watch your gear. Summer fish 30-80 Feet June-Sept.
4. Church Rock - Prime salmon hole May-Sept. Anchovy fished 20-90 feet, best at slack and slow flood tides, but can produce any time. 5. Whirl Bay - Grade "A" Winter spring territory. Sandy bottom means that you don't loose your gear if you are just learning how to fish. Nov-Jan, start in shallow at 100 feet and move deeper, staying on the bottom out to 250 feet. Watch for bait going by in the strong currents coming in and out of Race Passage. "The Beach": Camper Creek, Logan Creek. 15 minute run from Port Renfrew. June-Sept, shallow fishing for trophy Chinook salmon, 20-40 pounds with a few 50 pound plus caught per year. 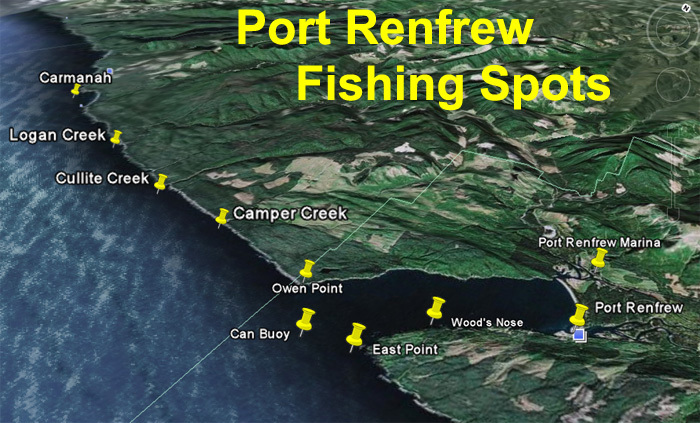 East Point, Can Buoy: minutes outside Port Renfrew harbour mouth. Summer Chinook salmon fishing July-Sept, coho fishing Sept-Oct.